For a couple of months, the Apple hub has been frantic and excited about the iPhone 8. This Tuesday, Apple did not hesitate to give them what they want: excitement. Alongside Apple’s announcement of their newest phone which is the iPhone 8, iPhone-fanatics were truly in a gaze when they found out about the other products Apple would release. Brace yourselves for the iPhone X which was announced yesterday, September 13, 2017 on Tuesday. For its 10th year anniversary, Apple decided to tackle things at a whole new different scale. For the first time, the iPhone X will cost more than any iPhone ever built and it will ship later than what we all expect. iPhone X as Apple said, is pronounced as iPhone 10. Although it’s kind of new to the scene, it’s definitely going to change 2017, said Apple. The iPhone X takes Apple’s design into a different route. With new features and design in place, people would truly be dumbfounded by the news. Surely, a lot of people were shocked when iPhone first introduced the fingerprint sensor. iPhone X does not have it, after all. It leaves behind everything you physically know about the iPhone. Yes, it will no longer have the home button and its screen will be 5.8 inches. I know that you’re here for the price and specifications. With that said, let’s cut to the chase and answer all of the possible questions that might have formed in your head. What is the iPhone X and when will it be available? The iPhone X, much like the iPhone 8 is the headline of Apple for 2017. It’s like their main event, per se. According to reports and from Apple, pre-orders can be made from the 27th of October. It will be on sale on the 3rd of November. Furthermore, the supply of course will be limited than expected. A lot of orders may come and not all orders may be accommodated immediately. Although this is the case, Apple would definitely make a way or a workaround for this. Its official release date is in November which is later than the normal iPhone release. But as per Apple, the wait and price will be worth it. In terms of pricing, how much would it possibly be? At 64GB, the unit would cost somewhere around $999/£999, and AU$1,579. At 256GB, it’ll be at $1,149, £1,149, AU$1,829. Having that said, it really is the most expensive iPhone ever made and ever sold at the market. With a price like this, can you imagine all the possibilities and capabilities this smartphone can do? Although the price can be a bit staggering, in reality, it really doesn’t cost much as 4.7-inch screen phones do. In a perspective, the rate of the iPhone is somewhere around $300.00 higher and that’s just like a dollar in 10 months. How would the newest iPhone look like? Well in this category, I can say that the iPhone really changed their game. Although Apple made the iPhone X bigger, it’s definitely a lot easier and more comfortable to hold than an iPhone plus. And although the screen is 5.8 inches, which is Apple’s biggest screen yet, it’s also just slightly lighter than the iPhone plus. But how, you may ask? Well, the dimensions give you a shorter height of 5.65 inches (143.6 mm) and, importantly, a smaller width of 2.79 inches (70.9 mm). It weights somewhere around 6.14 ounces (174 grams), too. 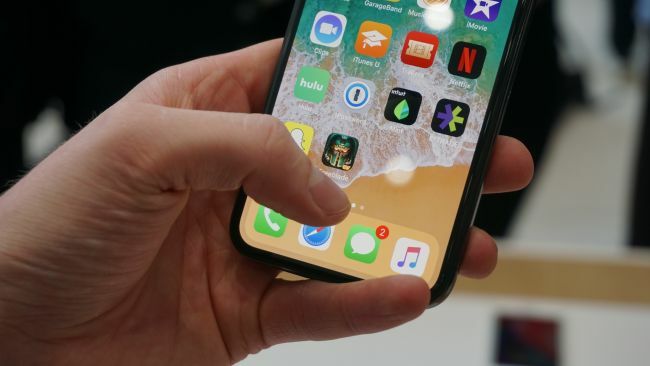 For its screen, Apple is using the what-they-call “Super Retina Display.” It’s now going to have an edge-to-edge screen display and it uses a 5.8 inch OLED material. For the first time, Apple said that it’s the perfect phone for an all-screen OLED display. As we all know, they have been using LCD, right? But again, this phone’s the game-changer. And since it’s going to be an all-screen phone, it will lack the bezel at both the top and the bottom of the phone which gives more space for the display. Although it doesn’t have the signature curve of Samsung’s Edge phones, it’s a pretty good start for iPhones. Well yeah, wireless charging isn’t new but what’s good about this is the fact that you can charge multiple devices using AirPower. 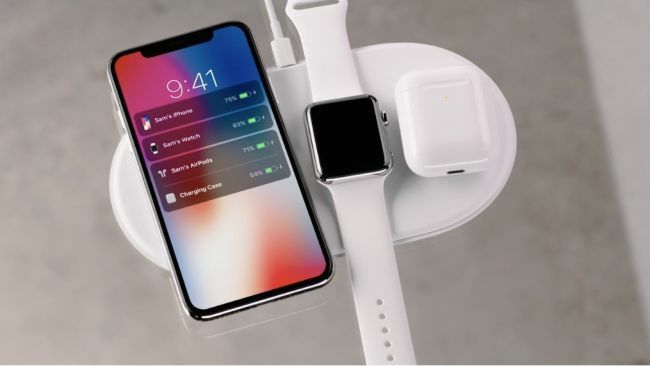 With this, you can charge your iPhone X, your Apple Watch, and Air pods. Alternatively, you can still charge the phone using the existing Qi chargers available for newer versions of the iPhone. The wide-shaped area of the pod can definitely be your answer in charging multiple devices at once. To finally cut the hearsays that are spreading, YES, the iPhone X has the home button eliminated. Giving the screen and the display more space for more features and activities on your phone. But how do you open it, you may ask? Well, the fingerprint sensor is now replaced by the face sensor. For you to open the phone, you would need to align your face to the front-facing camera and if it unlocks, swipe the screen upward. In addition, the Control Center is also a simple swipe-down from the top of the screen. Now this might be the part where it would sound weird. The all-new iPhone X would have its camera in a vertical position. Yes, we’ve seen the iPhone 7 and its innovative approach because of the dual lens camera; the iPhone X however, has its camera 180 degrees turned – vertical. These cameras have larger and faster sensors, has a wide range of angle, stabilization, and telephoto lenses. Meaning, if you’re a bit shaky when taking photos, it wouldn’t be a problem anymore. 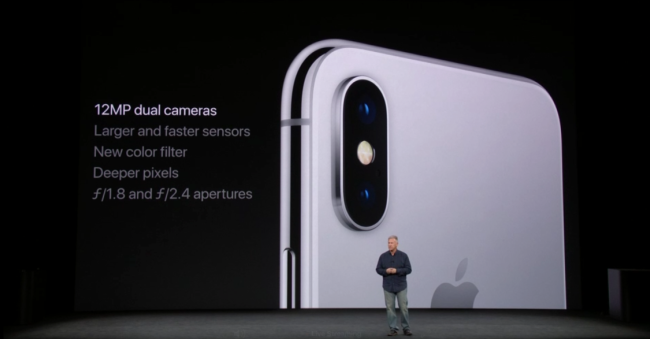 Both lenses offer 12 MP. For now, this is what I can offer you with the newest iPhone model. As you noticed, a lot of things went through change and we cannot blame Apple for that. With the new iPhone X, it’s possible that your view on Apple devices get changed for the better. Take note of the dates of the release. The October date is for pre-orders only and there would only be limited supplies for those. On the other hand, the November 3 date is the actual release date and this is when shipping can start. The all-new iPhone X is a definite game-changer, don’t you think?